Every day, curtains are exposed to dust and dirt that can affect their longevity and harm your health. Custom made curtains offer privacy and elegance, whether you live on a larger property in the Perth surrounds or in an apartment in the heart of the city. Just like carpets and couches, your window dressings need to be looked after to prevent stains, dullness and funky smells. Vacuuming to remove loose dirt, dust and pet hair is the key to fantastic curtains. 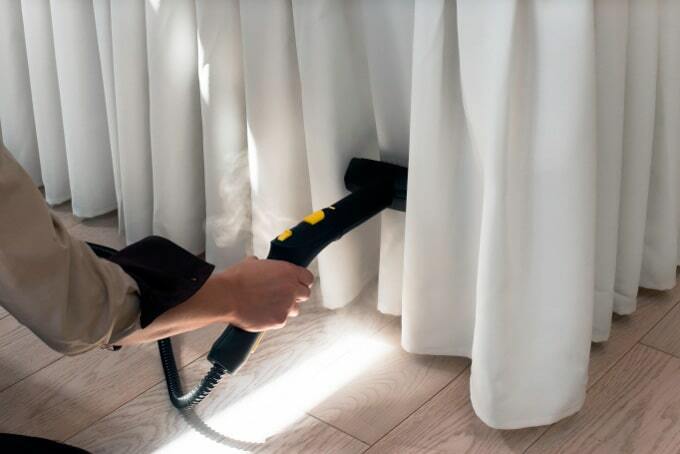 Use a soft brush attachment to gently vacuum hanging curtains from top to bottom. Sheer curtains are easy to clean – a good shake is often enough to get rid of dust and debris. Small marks can be spot cleaned with water and mild detergent, and a few hours out in the Perth breeze will help freshen them up. Lightweight curtains can easily be machine washed. Remove all hooks, rings and trims, before running a delicate cycle with gentle detergent. If you’re worried about your curtains shrinking, try hand washing them instead. Steam cleaning is best for heavy fabrics such as blockout curtains, and will save you hours in drying time. Work from the top to the bottom of hanging curtains, and keep the steamer far enough away that the curtains don’t become wet. Curtains with a rubber backing need a little extra attention. Hang them outside and spray with a hose, then use a gentle detergent to sponge clean. Rinse with cold water and leave to dry, making sure the backs of the curtains don’t touch anything. Whatever the material, your best bet is to keep your curtains out of the dryer. Hang them outside but keep them out of direct sunlight, as the harsh Perth sun can cause fading. Don’t fold or bend your curtains; most creases will drop out, but a low-heat iron will take care of the rest. Use a clean wet sponge to blot the stain, then dab with white wine vinegar. Alternate between dabbing with the sponge and vinegar until the stain has lifted. Remember to do a spot check first. Always check the care instructions for specific cleaning requirements and avoid using harsh cleaning products. Aim to wash your curtains at least once a year, preferably during warm weather so they dry easily. Adding curtain care to your spring cleaning list is a great idea and will keep them fresh following Perth’s damp winter months. If you’re living in a Perth rental, you should consider cleaning your curtains at the end of your lease. Keeping them free of dust, dirt and stains will give you the best chance of getting your bond back. And if you’re selling your home, refreshed curtains could give you the boost you need in the tough local market. Odour and dust free curtains are a definite selling point, and clean curtains will make your rooms look brighter and more stylish. Window dressings can be a hotbed for airborne dust, dirt and allergens. They can also be home to insects, mould and mildew that can wreak havoc on your health – especially if you or your family have asthma or allergies. Proper curtain care will not only extend the life of your curtains by preventing staining and dullness, but also keep dust and allergens at bay for a healthy living environment. If you’ve followed all these steps and your curtains are still dirty, smelly or worn, it might be time for an upgrade. Visit our Perth showroom or book a private in-home consultation to find the perfect style for your home. Do you have any helpful hints that make cleaning your curtains a breeze? post them to our facebook page and we’ll share our favourite advice.